Nigela Sativa is an annual flowering plant native e to south and southwest Asia. The fruit is a large and inflated capsule composed of united follicles, each one containing numerous seeds which are proven to have many health benefits. 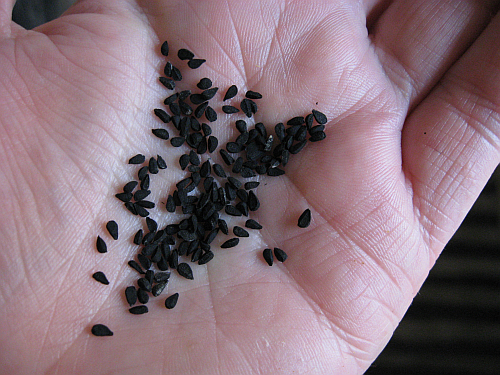 The black seed is used for treating digestive tract conditions including gas, colic, diarrhea, dysentery, constipation and hemorrhoids. The black seed oil contains phytochemicals which produce the same results as modern synthetic anti-allergic drugs but black seed does not have the negative side affects. The anti-inflammatory, anti- spasmodic effects of the black seed oil reduces the intensity of the asthma symptoms. • It´s also used for birth control, to start menstruation and to increase milk. • It´s used in combination with Cystine, vitamin E and saffron to ease the side effects of a chemotherapy drug called cisplatin. • Suppresses Liver Cancer Growth: A thymoquinone extract from nigella sativa prevents chemically-induced cancer in a rat model.